Cooking with toddlers can be simple and fun with the right recipe. This cheese puffs recipe was super duper easy and super duper yummy. My two-year old had a ball making her very own snacks. I believe that the best time to get kids interested in cooking is during the toddler years. That is the age when they are most eager to help and are craving moments to show off their newfound independence. My 2-year old Step Stool Chef-in-Training’s favorite thing to say right now is “I do it myself”. She LOVES to cook with her brother but more and more has shown that she is ready to step up to the step stool. So I found the super easy Cheesy Puff recipe that would give her a turn at cooking more independently. The first step is to create a simple egg wash with one egg and a tablespoon of water. I cracked the egg for my little chef in training even though she confidently tried to convince me that she could do it herself. Using a spring whisk made beating the eggs a breeze for her tiny hands with the simple up and down bouncing motion. Lay out the thawed pastry dough and let your little chef in training have fun with cookie cutter shapes. We used stars but it would be a great idea to use different type of shapes and use it a great teachable moment to review their favorite shapes. I grabbed an extra cookie cutter to demonstrate how to use the cutter and jumped in to help in moments where she had trouble. I covered a baking pan with parchment paper to make sure the puffs didn’t stick to the pan. My Step Stool Chef in training loved lining up the stars on the paper and we used this opportunity to practice counting. We got up to 24! Adding the egg wash was a bit tricky as we didn’t have a pastry brush. A brush would have been ideal for her little hands as she is already familiar with how to use one from her art & craft projects. I gave her a spoon but had to explain how to lay the spoon against the pastry flat versus using it to poke the stars. She quickly got the hang of it. Use a pastry brush to make adding the egg wash easier for little hands. Next, sprinkle each star with a pinch of cheese. At first, my little one would grab a handful of cheese and dump it on the stars. I shared how to use her index finger and thumb to place a smaller amount of cheese on the dough. Finally, you place the dough in the oven for about 10 mins until the cheese melts and the dough puffs. My daughter absolutely loved her creation. It felt like an art and craft project that you can eat. She was so proud of herself and kept repeating “I made this” as she enjoyed her treat. This Cheesy Puffs recipe gets 5 stars! Want to make cheese puffs at home? Try these recommended products to make it fun and easy! 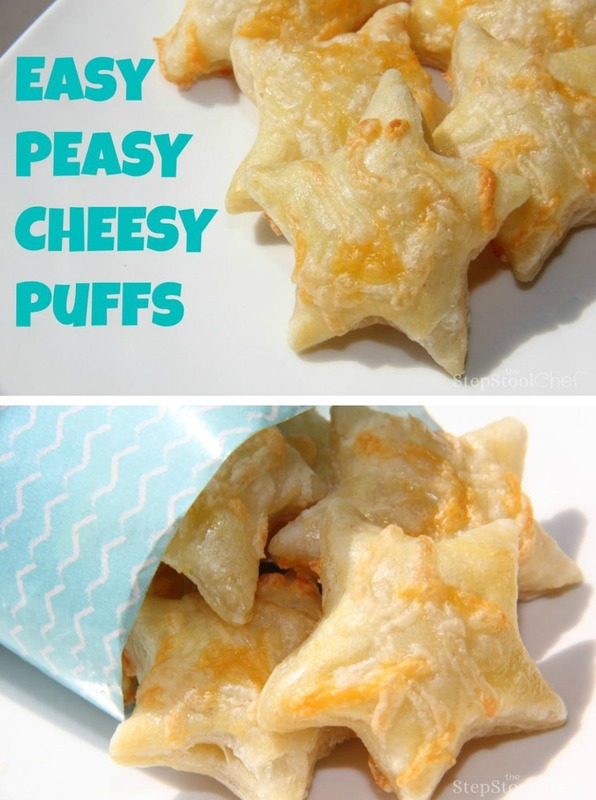 Light and airy, these cheesy puffs make a perfect snack that kids of all ages can make. Preheat the oven to 350 degrees and thaw out pastry dough according to the instructions on the box. Mix egg and water to create egg wash.
Lay shapes onto a sheet of parchment paper on your baking pan and brush with egg wash.
Sprinkle a little cheese onto each shape. Bake for 10 minutes or until cheese has melted and pastry puffed. In this recipe, we used a Mexican style four cheese blend which included Shredded Monterey Jack, Cheddar, Asadero & Queso Quesadilla Cheeses. What a delicious and easy appetizers for the holidays! Thank you so much! I can’t wait to try that great bread recipe. One-hour bread… fantastic! Trackback from The Best Sweet Potato Pie Recipe - Were parents! ?